After winning Tuesday's opening race, Hanuman paired an initial fourth place to victory in the second of the two windward-leeward races on Wednesday (August 23) to open up a three-point leading margin at the J Class World Championships in Newport. Although Hanuman led across the finish line at the conclusion of a thrillingly tight first windward-leeward of the day, so closely were the chasing pack snapping at their heels that they dropped to fourth on corrected time. Topaz won their first race ever when they held off Velsheda by just seven seconds, while Lionheart's margin for third over Hanuman was just two seconds. There was not as much doubt in the second contest. 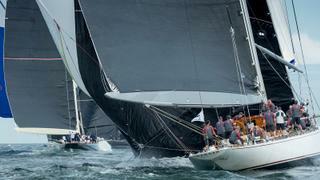 After breaking clear of Velsheda, Hanuman gradually eked out their lead to finish one minute and 17 seconds ahead of the championship's sole 'original' J Class yacht. The south-westerly breeze came in on cue at between nine and 14 knots, meaning the second race starting at 15:35 was the windier of the two. 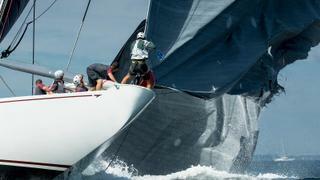 There were more than enough shifts in wind direction and pressure to keep the contests tight and even. Topaz battled back from sixth at the top mark in the first race to make a wholesale gain on the west side of the second upwind leg, tailgating Hanuman around the final turn, a gain orchestrated by local Newport ace Tony Rey in concert with tactician Ross McDonald. While Hanuman carried on to the right after a conventional bear away, a nicely executed gybe set cashed in Topaz's gain against a frustrating small error by Hanuman. But the hugely experienced Hanuman team, lead by skipper-helm Ken Read, sailed smart and clean for their victory in the second race. "There was a moment in the second race after the top mark where Jim and Kirsty Clark and myself all caught each others' eyes and all three of us at the same time exhaled loudly at the same time as if to say: 'Phew, this is close!' Such great sailboat racing," said Read. The opening upwind legs were gripping, no one side or the other paying an obvious dividend. Hanuman won out from the game of patience played between the four boats on the middle left of the first beat in the first race. But after having had to tack away to the right from a slowed, understandably cautious start at the signal boat, it was Velsheda that lead Hanuman around the first mark but then lost out to Hanuman and to Lionheart at the bottom of the run. Topaz's comeback on the second beat was the foundation of their win, but it was the kite set that made the difference. 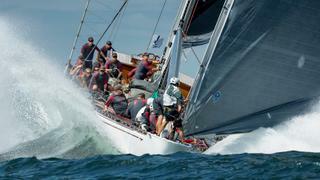 "To get the first win for the boat at these world championship is great for the while team and for the owner," said Peter Holmberg, helmsman of Topaz. Since being launched in 2015, Topaz has only raced at the St Barths Bucket regatta in the Caribbean twice, in 2016 and this year, before competing at both of the Bermuda J Class events in June. In fact Topaz led the world championship after Race 2 but blotted their copybook when they had to take an expensive penalty on the first beat of the next race for tacking in front of Lionheart, going on to finish sixth. Hanuman's crew work was slick, pushing their sail handling technology to the maximum. Read comments: "This is full on. 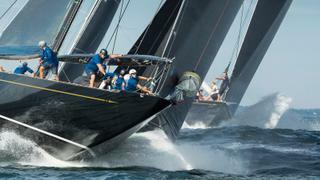 Whoever would have thought that boats like these would be sailing at these speeds? You have to put a lot of trust in everybody. We have 25 crew and every person has a very specific job and if one person does not do their job this thing can fall apart in two seconds." In this fleet Hanuman's three point lead is nothing. 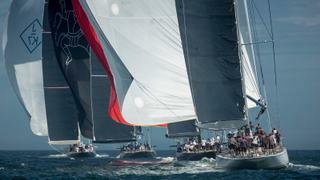 Lionheart, the winners of the America's Cup Superyacht Regatta and the America's Cup J Class Regatta, are poised in second and Velsheda lie third, having been second and first at the first turn of today's races. Thursday’s forecast is for lighter airs, but the breezes are set to strengthen once more for Friday and Saturday.